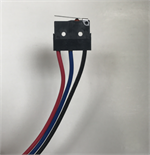 Magnetic Switch for use with LevALERT Indicator for operation with Electric Devices. For use on AC or DC Circuits max current 5VA. Consider Relay sold separately for higher loads. Model 9700-5 Mechanical Bin Level Indicator (requires not power) for Heavy Material w/Density 50 to 100Lbs Cu Ft. Installs bin wall to 3/8" thick. Install outside Bin through a 1-1/8" hole. Options (sold Separately) include 3 A SPDT Switch model 10100. LevALERT Model MK2P-S-DC12 Relay, 12VDC Input Power. DPDT 10A Relay Output. Consider socket sold Separately. LevALERT Model MK2P-S-DC24 Relay, 24VDC Input Power, 10A DPDT Relay. Consider socket sold separately.